The 360 Challenge Stradale sports car, built between 1999 and 2004, was the road-going version of the 360 Modena Challenge, a pure track variant, both built as part of the Ferrari Challenge race Series. Launched at the 2007 Frankfurt Motor Show by no less than Michael Schumacher himself, and with a price tag of $250,000, was the Ferrari 430 Scuderia (whose name meant "a stable of horses"). This two seater Berlinetta sports car was the natural road legal successor to the 360 Challenge Stradale, and was designed to counter the likes of the Porsche 911 GT3 and the Lamborghini Gallardo Superleggera (meaning super lightweight). Just lIke its predecessors in the Challenge Series, the 430 Scuderia's cabin was stripped of all unnecessary items, coupled with extensive use of carbon fibre, in order to minimise weight. 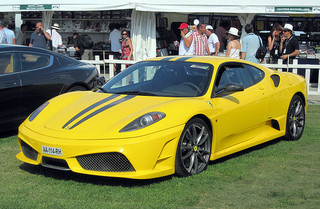 Consequently, with a net weight of 1250 kg, it was 100 kg lighter than the production F430. The cabin's interior received extensive use of leather. The six speed F1-style paddle shift gearchange system used in the Scuderia was further modified with "Superfast 2" software so that the shift speed was reduced from 150 to just 60 milliseconds. A further development was that the F1-Trac traction and stability control was integrated with the E-Diff limited slip differential to produce a single electronic control system which enabled the driver to achieve an increase of up to 35% in acceleration when emerging from a corner. In terms of aerodynamics, further increases in downforce resulted from the use of several detailed modifications, including a redesigned rear diffuser and spoiler. It retained the Manettino switch on the steering wheel whereby the driver could electronically control important features relating to prevailing road conditions, such as stability, traction control, altering the gearshift speed, and the setup of the shock absorbers. 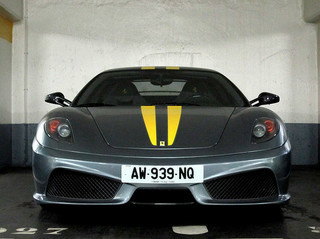 Carbon fibre kits could be purchased for the Scuderia for such components as the front spoiler, sill panels, and diffuser. 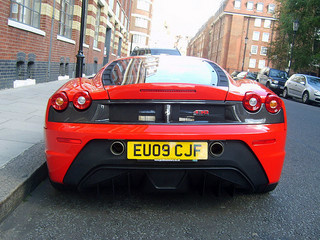 The 430 Scuderia was powered by the same mid-engined, 4.3 litre, DOHC V8 engine, with four valves per cylinder and dry sump lubrication, as the F430. However, output was increased to 510 bhp at 8500 rpm (redline at 8650), and 347 ft/lbs of torque at 5250 rpm by increasing the compression ratio from 11.3 to 11.9:1, and modifications to both the inlet ducts and exhaust system, together with a new piston design. This produced a top speed of 198 mph, and a 0-60 mph time of 3.5 secs. 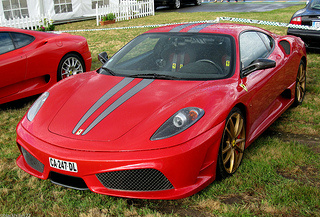 A Ferrari 430 Scuderia in good condition would fetch around $185,000, whilst one in showroom condition would command up to $350,000. Another of the classic cars from Ferrari.